St. Martin's Press, 9780312206161, 160pp. 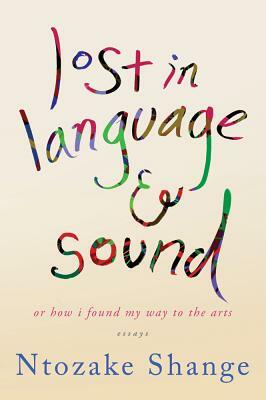 A vibrant and vital collection that celebrates the three most important muses in the life and work of Ntozake Shange—language, music, and dance. In this deeply personal book, the celebrated writer reflects on what it means to be an artist, a woman, and a woman of color through a beautiful combination of memoir and essay. She describes where her love for creative forces began--in her childhood home, a place where imagination reigned and boredom wasn't allowed. The essays tell stories ranging from the poignant origin of her celebrated play "for colored girls" to why Shange needed to deconstruct the English language to make that production work, from the intensity of the female experience and the black experience as separate entities to the difficulty of living both lives simultaneously; from the intense love of jazz bestowed on her by her father to a similar obsession with dance, which came from her mother. With deep sincerity, attention, and her legendary candor, Shange's collection progresses from the public arena to the private, gathering along the way the passions and insights of an author who writes with “such exquisite care and beauty that anybody can relate to her message” (Clive Barnes, The New York Times). NTOZAKE SHANGE is a renowned novelist, playwright, and poet. Her works include the Obie Award-winning "for colored girls who have considered suicide/when the rainbow is enuf," and the novels "Betsey Brown," " Liliane, ""Sassafrass, Cypress & Indigo, and Some Sing, Some Cry, " which she co-authored with her sister, Ifa Bayeza. Among her honors and awards are fellowships from the Guggenheim Foundation and the Lila Wallace-Reader's Digest Fund and a Pushcart Prize. She lives in Brooklyn. "...if there's another writer in America who can write prose like this - with this sort of intricate layering of linguistic play - I wish someone would direct me to them.... If Shelley were reborn as a black woman in the mid-20th century, maybe he would write like this.... Shange roars with pure literary fire." --The San Francisco Chronicle "The energy of Ntozake Shange’s writing is often spellbinding.... lost in language & sound is an enthralling look into the engaged life and mind of a huge-hearted storyteller." --The Dallas Morning News "The raw power of her writing, from the subject matter to her unconventional punctuation, aligns perfectly with the crescendo of for colored girls’s success.... This is a profoundly personal yet all-encompassing exploration of words, movement, and the state of race in America." --Publishers Weekly (Starred Review) "...emotional, grateful and often wise."